Finally – a weekend at home! I realize that doesn’t sound like an ideal situation especially in the summer, but after five weekends in a row out of town and many road trips I was happy to be home for a weekend to do nothing! 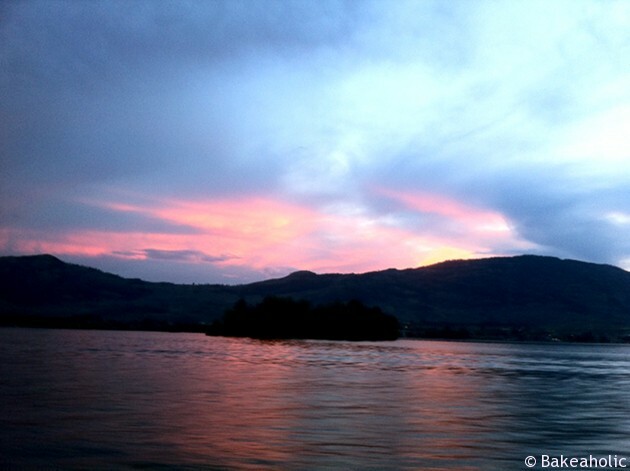 We ended our fifth weekend away in Osoyoos with my whole family for the long weekend. My mom, brothers, nephew and all of our boyfriends/girlfriends were all up for the weekend. We all arrived a day or two after one another with my brother Nick and I going up Friday night and my mom arriving Saturday and my other brother arriving Sunday. It was gorgeous – a super hot 30+ each day. My mom and Nash have a condo right on the lake with the best view. My older brother came down in his big RV and towed his boat with him. We spent Sunday night and all of Monday boating and tubing around the lake. It was the perfect long weekend getaway and a great end to our five week whirlwind of road trips. It’s about a 4 1/2 – 5 hour drive up to the lake and somehow we always forget how very, very long it is. We left friday after Adam got home from work and were on the road at about 6:30. We arrived at the condo at 11:30 at night after a short stop in Princeton to let Lainey out for a walk. It was worth it though to wake up Saturday morning on the lake in the glorious sun. The drive home always feels a bit shorter, however still long. I made these when we got home form Osoyoos last week. After five weekends away our eating habits went downhill. With every road trip there were road trip snacks, numerous bags of flavoured chips (Adam is obsessed with these cheesy bacon something or other chips from WalMart, I don’t really like chips), twizzlers, pretzels, s’mores, baked goods, and other campfire foods. I was actually really happy to be home for a weekend just so I could cook and eat regular food. 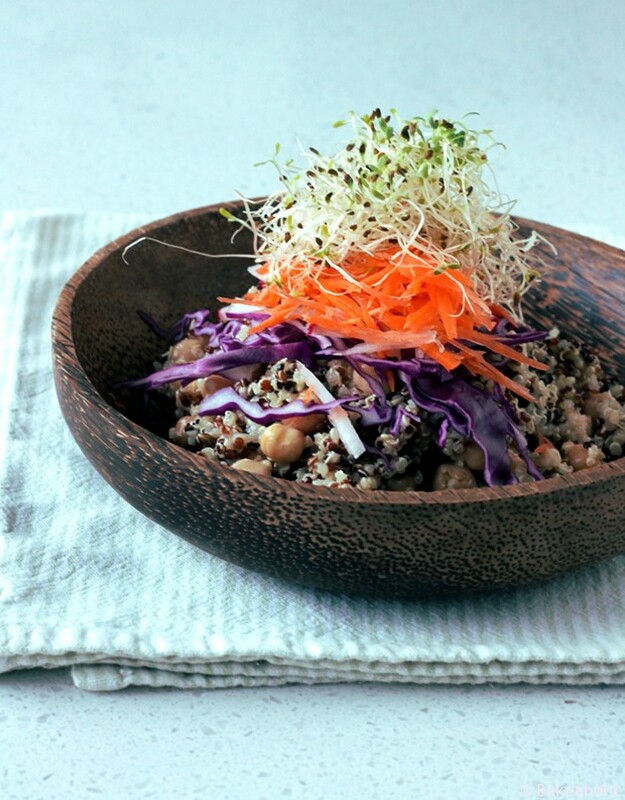 There’s lots of buddha bowl, protein bowl and hippie bowl creations in vegan / vegetarian restaurants. My first experience was at Chaco Canyon Cafe in Seattle when I ordered their Hippie Bowl. It was really simple, but so good and filling. I’ve wanted to re-create it and now that I had such gorgeous wooden bowls I thought it would be the perfect platform for a good hippie bowl. Adam also left last night to go to Ontario this week for work, then we’re both headed to Vegas on Friday! While he’s gone I thought I’d challenge myself to eat a week of vegan foods. I’ve said it before and I’ll say it again, I pretty much eat vegan all day until dinner. I have an egg allergy so eggs for breakfast isn’t my thing, and I have a dairy allergy so I drink almond milk regularly. I’ve been having a ton of smoothies for breakfast/lunch or salads. Adam is the meat eater, so I usually make meat with dinner. However, if it’s just me I’m satisfied with a large amount of veggies for dinner. So, we’ll see how it goes! I’ll post the entire week’s recap in the next week or two! 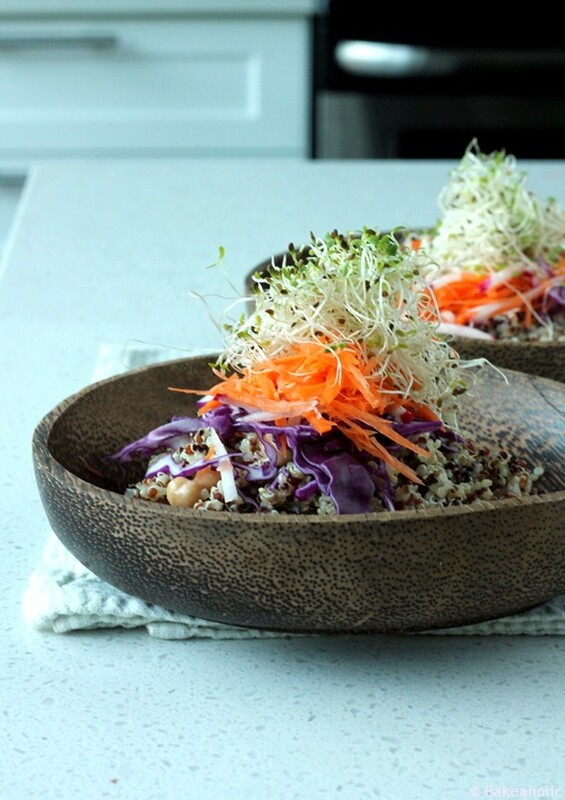 A ‘hippie bowl’ usually has a base of quinoa or other warm grains mixed with a miso or tahini sauce and topped with an array of raw veggies. I made ours with tri-colour quinoa and a garlic tahini drizzle like Chaco Canyon, and topped with a variety of raw veggies I had on hand. This is a basic hippie bowl, but there a lots of add-ins you can include. This is a great quick dinner for Meatless Monday too! Directions: Add all ingredients to a blender or food processor and mix until smooth. This dressing is even better when it has sat overnight in the refrigerator. Make it the night before, and store leftovers in the fridge. Directions: In small pot add the 1 cup uncooked quinoa and 2 cups of water. Bring to a boil over high heat, then reduct to low and cover with lid for 15 minutes. Remove from heat when done and set aside. Directions: Using a mandolin shred/julienne the carrots and radishes. Change the blade to the slicer and slice the cabbage so it shreds into fine strands. If you don’t have a mandolin you can use the grater attachment on a food processor, or a hand grater. To shred the cabbage simply cut it into thin strips with a knife. 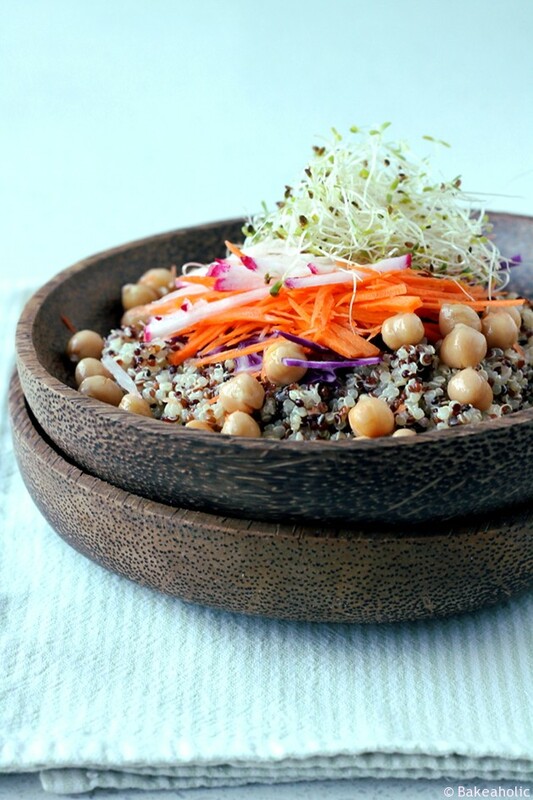 Directions: Combine 2-3 tablespoons of the garlic tahini dressing with the cooked quinoa. The heat will melt the sauce and coat the grains. Add in the rinsed chickpeas and toss again. Scoop 1/2 cup of the quinoa and chickpea mixture onto a plate/bowl. Top with the cabbage, radishes and carrots. Top with alfalfa sprouts.